I miss Polaroid! I’ve been stockpiling some old film, but I’m always afraid to use it and run out for good. 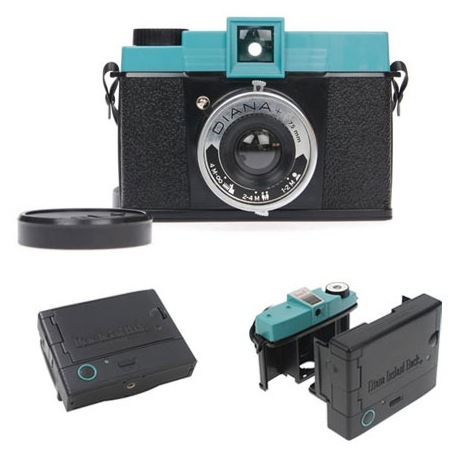 It looks like the Instant Back attachment for the Diana+ Lomo camera might serve as an able replacement. The Instant Back attaches to the Diana+ and provides you with instant (90sec) print outs, just like Polaroid. It looks like it will do until the Impossible Project begins manufacturing their new film for the old cameras. Of course, after Scott’s post below, a purchase of any other type of camera besides the 5D seems pointless. I have to start saving now! Polaroid: The Rebirth o.. Diana + Impossible Project Inst..
One of these would be awesome to have in my camera bag! It depends on if you actually like Polaroid’s film or the format. If its just the format, get one of these cameras or a Fuji off of Lomography.com, because they use Fuji Instax Film and it’s still heavily produced. Fuji also still produces pack film which is compatible with a great many older Polaroid cameras. And believe me, there is nothing more fun that snapping a pic with my Colorpack II (You can get Colorpacks and the like off of eBay cheaply… just make sure they have spreaders) and doing the whole: grip, pull, wait, peel thing. Yeah the price is definitely a turn off, especially when the quality of the material is quite low. That plastic just feels so cheap. Thats brilliant. Saving will have to start. But agreed, this is a find. I don’t think it’s so much the quality that i look for in the polaroids, but the nostalgia of having the polaroids lying around the house. Takes me back to being a kid, and what’s better than that?